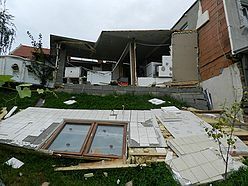 Farmer Otto Guggenmaier, 56, is recovering after his home-made schnapps still exploded with a blast so powerful it ripped the wall off his house. The farmer – who ran a distillery to boost business in Entschendorf, Austria – was adjusting the still when it blew up, showering him with boiling schnapps. Fire investigators are sifting through the debris to find the cause of the blast.